It's easy to apply and it looks just great on my Edge. Just make sure there is no dust left on the screen before applying the screenprotector. It took an unacceptably long time to arrive, - more than 3 months ! However the product lives up to the hype and does an excellent job. Fitting was straightforward and after a couple of days, fully cured and functional. It provides a pleasant soft - touch, perfect response, and fit. I would recommend this protector. The pho be case arrived quickly and was well packaged. I have bought several screen protectors and nothing seemed to work for me but that changed when I bought the BodyGuardz screen protector it helped massively and I'm very happy with it can finally relax knowing I have a great protector for my screen, s7 edge BodyGuardz Screen Protector is highly recommended . These clear screens are always a pain to apply, but the gel provided for wet application helps enormously. This has stuck well over the Edge curves with no peeling (though some adhesive has gathered slightly, but it's not unsightly). If you aren't happy with your current screen protector, this is worth shelling out on. Beware not fit for purpose !!!!!! Brand new handset straight out the box used gel method edges came away after 24hrs total waste of money do not purchase !!!! Despite using the gel I couldn't get it to apply without bubbles (used two of these). This may be my deficiency in not getting it right but my experience is that it doesn't work. It was a little fiddly to get onto phone, but once on, looks good. Tried so many different protectors when I first got my phone, this is the only decent one. My phone had to be repaired and they changed the screen, this was the first one I went for this time around. This Screen protector is basically good for protection against scratches. however, unlike the tempered glass it would not withstand impact. I am not complaining anyway because it was the only one that could work with a back case for my S7 Edge. Surched high and low for a good quality screen protector and found mobile fun. Read lots of reviews about several ones and decided to choose bodyguardz ultra tough I have been very pleased easy application choice the gell method which turned out very successful. ON ORDERING the product I was told it was out of stock but the customer service team were extremely helpful all through the delay process and even offered to upgrade the postage so that when it was back in stock I would receive it far quicker. I can say that next time they will be my first port of call as I was very satisfied with the way that it was dealt with. So I hope this is a reassuring review and will help others in purchasing a product from this company. Have been searching for a screen protector for a while that would actually stay on the phone without the edges catching on the case. This one does the job and keeps the screen free from scratches. After following the instructions exactly and cleaning everything properly, the gel method still doesn't allow time to reposition without lifting up and getting dust under. Also it only covers half the edge! Rubbish. Ripped it off. Easy to fix to handset using silicon. The screen cover went on well and seems to be fair quality but it was evident as soon as I put it on that it would not go to the very edge of the curved S7 Edge screen. Probably about 5-8mm too small. Not happy as the packaging says it will cover whole screen. I've read/watched a lot of reviews before buying this protector. One can understand why. So I took a dive and bought it. It was easy to apply using the gel provided. You get a video tutorial as well.The protector just glides so you can adjust. It doesn't cover the edges so you feel it when sliding left or right. Screen is still responsive. No bubbles. It fits well with the Spiglen Neo Hybrid. 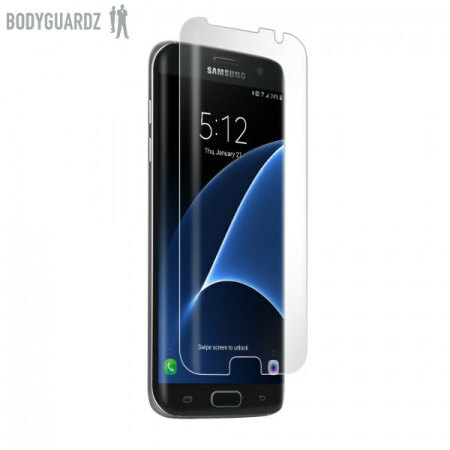 I have recently ordered BodyGuardz Ultra Tough Samsung Galaxy S7 Edge Screen Protector and I am over the moon as I could not find any bubbles and the product was amazing. My earlier screen guards purchased are hard to put on phone with out bubbles and its frustrating to get rid of them. I am very happy I found right product for my phone. Make sure to clean the phone screen properly before applying the screen protector. Once applied, it actually takes a couple of days for the protector to properly stick to the screen and become crystal clear. It looks dodgy at the start but after 2 days, it's perfect. I fixed it on with the gel method and it looks really good and fits well. You can just feel the edge of protector but you'd have to be heavy fingerd to lift it off. Overall a good product that can be used with my view case, perhaps a tad expensive, time will tell. Not a good screen protector at all for the top end price, already coming away at edges after just a couple of days, very disappointed. I ordered this on the reviews and video. I used the gel method which was very straight forward and easily slips into place. But just recently I had to replace my phone. For my insurance purposes the phone shop decided to try to smash the screen with a mallett. Wrong idea. They made numerous attempts to smash the screen and it wouldn't break. They had to resort to removing the screen protector in order to smash the screen. This is why I am going to reorder for my new phone. Well worth the money. Not great for the price you pay! For some reason the wet application did not work for me, I left it overnight and did not stick at all, very disappointed. I used the normal application after and it worked just fine and looks good now. won't buy it again tho. I used the gel method of applying the protector and thought it was great. A few days later, bubbles started appearing on the edges and dirt started collecting under the sides. I feel like I've wasted my money. Was at my wits end looking for a reasonable screen protector that was easy to apply and case friendly. Watched Mobiles Fun's video on YouTube and decided to give it a try and have to say that following all instructions for the wet application it was quite easy. Any slight imperfections were totally gone the next morning and I really happy with my purchase and would recommend this screen protector. I have applied a lot of screen protectors over the years and find the whole process frustrating - trying to get the air bubbles out, failing, peeling back and re-sticking only to find dust has got under it and then spending the next 2 months obsessing over the imperfections I can see all over the screen until I replace it with another to go through the whole process again! Not with this one. The gel application is brilliant. I was apprehensive at first but you just have to dive in and apply as per the instructions. The gel means you can slide it into exacly the right place. Smooth out the excess gel and once dry the screen is clear, bright, feels well protected and no air bubbles or deris stuck underneath it! Doesn't feel rubbery either like some of the wet apply protectors (that also show dents or nail marks in their surface). Worth every penny. I found this to be a good screen protector for the S7 edge. It doesn't completely cover to the very edge of the screen but there is only approx 3mm of screen left uncovered around the edge. I used the gel method of applying the protector which was quite easy as long as you spend enough time smoothing out all the air bubbles and excess gel. This only issue I had is despite my best efforts I have trapped 2 very small pieces of something between the screen and the protector. One is in the middle of the screen and is really annoying me so I may have to buy another protector and try again but I would buy the same one. I wanted a change of case after using the atomic 2.0. I purchased this and a UAG case upon recommendation from Mobile Fun. I had no problems whatsoever installing the screen protector with the gel, there are no bubbles or lifts on the phone although there are a few minute specs under the protector due to me rushing the installation but otherwise top marks. Feels tough and the screen feels different. There is no loss of sensitivity though, which is great. Doesn't quite cover the curved edges, which might be a good thing if you have a case. Not convinced it will give protection against impact. wonderful online shopping, very accessible and very visual to use as I am a Deaf customer and most site require talking on the phone but this does not require any phone talking. Really pleased with the screen protector. Very easy to fit having read the instructions (very unusual for me to do that) and watched the video. Screen nice and clear no air bubbles phone works well. and phone fitted back into its case no problems. Would certainly recommend this screen protector. It feets well on the screen, I apply the protection with the wet method and it works great. Friendly case protection for the screen is the most important thing for me and this product is didn't disappoint. This screen protector producted is very good quality. Arrived promptly, easy to fit. More thsn satisfied. Recommend this product. Happy with the result although it would be better if it went further to the edge of the screen. Even with the cover on there is still a small gap. Whether this will be a problem later on I don't know. It's a thick durable plastic, gets about 99% of screen coverage. When you put it on with the applying plastic the edges stay up but once you remove that it sticks on the curves and everything. Do suggest if you're after a full screen protector and don't trust the tempered glass ones to stick to the edges. I dont understand why people say that this protector is bad. This product is super great. I bought a lot of screen protectors and with this one i win finally the jackpot. Its easy to fit without any problems and its cover the edge. I recomend this screen protector for any Samsung S7 edge users. Go for it and be happy. The S7 edge is a gorgeous phone but both front and rear glass screens need protecting. When you've spent the best part of £500 on a phone you really need to spend a little time and money on the screen protector. Firstly, a cheap Protector from a popular auction website is a false economy- I've done it - the curved glass ones don't work and the thin film type (like BodyGuardz) bubble up. So, on to the review. Great screen protector for a curved screen. I'm very happy with the product and it's worth for the money... Excellent!! Just tried to fit this awful product. Wet installation method doesn't work, just attracts dust and dirt. Might as well have thrown the money (+ postage) straight in the bin. Sadly this product wasn't that great and I ended up having to replace it. However the customer service at mobilefun was phenomenal! They emailed me soon after my complaint and sent me a new product of the same value with no extra cost. Thank you mobilefun! Great service! Wish id bought this earlier. Ive arounder 5 screen protectors that apparently fit the whole screen but all never stuck down on the sides. Even the zagg was a bag of rubbish. I've taken this one off and reapplied usong the wet method 3 or 4 times even using a wet wipe because i ran out of gel and it is amazing. Fits my case nicely too and the design not fitting all the way to the edge is a great idea. This is a top quality product, and if you have any questions about it, BodyGuards are very helpful. Two ways of applying either using its sticky backing, or using a gel (supplied) method which makes it easier to get it spot on. It has been money well spent. this .screen protector is completely rubbish and very expensive, do not recommend. Just a good screen protection. Two ways of puting on. Wet or dry i went the wet way. You must waite two days for it to dry but well worth it. I don't usually leave reviews but had to say a few things about this screen protector. When i purchased the screen protector, i thought it would be a tempered glass protector but that is my fault for not doing more research, even though for the money you would expect something more than a film. The film is not very easy to apply to the screen (i used the wet application)and most importantly, does not cover the whole screen. The edges are completely uncovered, as well as some of the top and bottom of the phone, making me wonder what is the point of this product. It's currently full of bubbles, which even though i tried to squeeze out with the card provided, they still kept appearing. I will leave it for a day or 2 to see what happens but it's probably going to end up in the bin. money down the drain...but it's my fault for not reading more about this product. I never write reviews but Just had to touch on this. Body guards screen protector is literally like the sticker that comes on your phone when you first buy it. This item is a joke of course its case compatible its so thin. I dont see this as a projecter. Im leaving it on it till i have time to go to the mall. What a waste i followed the instructions step by step bubbles wont go away. Dont waste your money. I could have ordered a pizza and feed my family. My rant is over. Hope this helps. This is my opinion. Over priced cheep sticker !!!!!! I love my screen protector! easy to install also! I have never been a fan of screen protectors because they always end up with bubbles regardless of how careful you are. This one though has been great! I opted for the wet application and this made it super easy to get the protector in place. Then use the squeegee to work out the bubbles and excess gel, wait 2p minutes and peels off the other backing. A little bit more work to get rid of bubbles then done! Fits the screen well and has no bubbles! The final result of the screen protector on my S7 edge is a beauty. Even though the screen isn't edge to edge, it's actually an advantage as it makes the screen protector compatible with cases. But, I found that at the bottom of the phone the corners peeled and gathered dust so I couldn't stick it back down again. However, this is my own error as I think I didn't correctly line up the protector to the phone. But otherwise, using a case with this screen protector is achievable. Also you are given the choice between either a wet or dry application so you can choose the best application method for you, making application feasible. Instructions were not very clear when it came to peeling the backing off, which meant there were a few sticky fingerprints on the sheet. Despite it claiming to cover the edges, it didn't really wrap over them and now the sheet has started to lift in the corners. Overall disappointing. This is by far the best screen protector. Tried tempered glass but every single one was useless. Screen protector covers the screen 99% but this is actually good as it works with every case ( there is a 1mm gap around the screen). Don't be afraid people when applied wet. At first I thought I did an awful job but after 24 hours all bubbles and the wet look goes away. I left the screen for like 30 hours alone and didn't use the phone or even put any case on as I was afraid it may peel off or something. Totally recommend the product. Dispatch and delivery is very quick. Packaged very well. Buy it. Worth the money. Son was very pleased with purchase. Works well. I used the wet method to apply this protector and I am so happy with the result. This is the first time that I have applied a screen protector and not had it poorly aligned or with air bubbles etc. Absolutely use the wet method with the product for a great result. Turns out to be great. I used the wet application approach. Followed instructions to the letter and all was ok until I had to remove the top cover. It took it all off, even though I waited 30 minutes to remove it. Luckily I still had gel left, reapplied, removed top cover and all was ok. The screen has adhered well to the phone with only one small bubble that is getting smaller. Screen appears to work well, I have had it on one week and no dramas so far. This is probably the perfect screen protector for my phone, the application Gel it comes with make it so much easier to fit without leaving bubbles and residual dirt, It covers the edges of the screen. Will definitely buy again if necessary. Followed install to the letter using gel etc and used old phone whilst it had the times etc stated to fix properly but no edges peeled almost straight away. What rubbish with a high price for it. Works petfectly, no edge issues when applying case afterwards as small gap allows for fit. Used wet method to apply, really simple no bubbles. Watch video on how to apply really helped. I used the Gel application method and was not confident it was working on the curved edges. So I wrapped my phone in 2 pieces of clingfilm hold edges down. But no need to worry as it did apply well, if it was the cling film or not it fits well and holding at moment, no curling just curving edges. This is a good screen protector for Samsung Galaxy S7 edge,just right to stickon the screen surface.I'm quite happy to have it and it's worth for the money you spent.Excellent. I followed the online YouTube tutorial and did the wet application. At first I was really worried as the screen looked like it was very bubbly but I kept squishing the liquid bubbles out with a credit card and left it for 30 minutes before taking the top layer off. It was hard to get the top layer off as the edge kept coming up when I tried to pull the tab so I opted to try it from a different corner instead and this worked. in 24 hours the screen was perfect and protected. Works a treat and the edges not covering the full edge screen was good because my case would have pulled the screen protector up anyway. I bought this hesistantly as i dont normally like screen protectors due to bubbling. However i had bought a tempered glass one for the s7 edge which was a let down. So at this price i thought i'll take a gamble. All i can say i am soo glad i did. It is the most simple and easy protector to apply. I used the wet method and at first i thought oh no the dreaded bubbles but they were easily squeezeed out and after leaving it for 20 mins it does make a difference as now you cant even tell the protector is on. It doesnt cover right up to the edge, but that is purposeful as allows compatibilty with many case covers. This screen protector is the best on the market at the moment for the S7 Edge. And I say this after wasting £85 on various others for my phone and my son's S7 Edges. This one fits perfectly and is purposefully slightly smaller than the screen in order to accommodate any case without lifting up. I had to buy a couple though as the first one came with a fault in it. Bought this item was a bit dubious as it seemed a lot cheaper compared to others so was worried about the quality but I have to say it is of excellent quality and value for money so much so I ended up buying 2 more for family easy to install it recommend the wet application takes longer but better results and don't worry if the edges don't stick down once it drys you won't even know you have a screen protector on you phone highly recommended. Very poor, impossible to position correctly and does not fully cover glass. A Brilliant product to give your screen total protection. Comes with clear instructions and a gel to slide the screen into place so easily. Recommended and best protector that I have come across. Great - Once you Get It On! So, ended up buying 2, great for mobilefun.co.uk but not great for my pocket! The first one, although easy to install (I used the wet method) had 4 specks of dust underneath, didn't notice these until it had dried out. So, using the wet method makes life easier, it does mean that you cant spot dust so easy, nor can you remove the dust using tape as the screen protector is wet! The second one, learn by your mistakes, went on without any problems! It was easy to peel and place quarely on my phone. I was worried that I couldn't remove all the bubbles first off. But I needn't have worried as the screen's curing remove them. I have now had the screen in place for over a week and it's perfect. Good. And not hard on surface. A llitle bit soft that i like much. But need a skill to affix on screen perfectly. Some small air bubbles on my screen but it is fine. The screen protector arrived in perfect condition. My wife and I tried the gel method of installation and wound up very frustrated; the curved edges would not stay down and when peeling off the top cover sheet (after an hour wait) found everything peeling off with it… it is all in the rubbish now… what a waste of money! The protector is tricky to install, but once installed correctly, it adheres to the screen well, and is perfectly clear. The only drawback is that it doesn't fully cover the edge screen. A couple millimeters of the edge screen is exposed on either side. But the excellent case-compatibility of this protector definitely trumps this drawback. Does what it says on the packet but does not cover the curved edge. Combined with a back cover it does provide protection and it is really slippery to apply. On the whole quite pleased with the product as it stops my keys in the pocket, scratching the screen. Followed the instructions and watched several video tutorials. I used the enclosed gel for a wet application, however the protector did not stick to the screen. Waste of money!!!!! Initial thought of this screen protector were very good until I put it to use in my pocket within days it has light scratches down the length of the screen were I have taken it out of my pocket. The phone has been the only thing I keep in that pocket. It's not as hard as it has to be flexible to curve round the edge, this compromises the hardness of material unfortunately. Doesn't look anything like the photo either, it doesn't go around the speaker or home button. Sadly I had already applied the gel so I've lost my money. DO NOT WASTE YOUR MONEY!!! We have updated the image and apologise for any inconvenience this may of caused.